Last Sunday, like millions of other people, I was counting down the hours until the season seven premiere of AMC’s The Walking Dead. 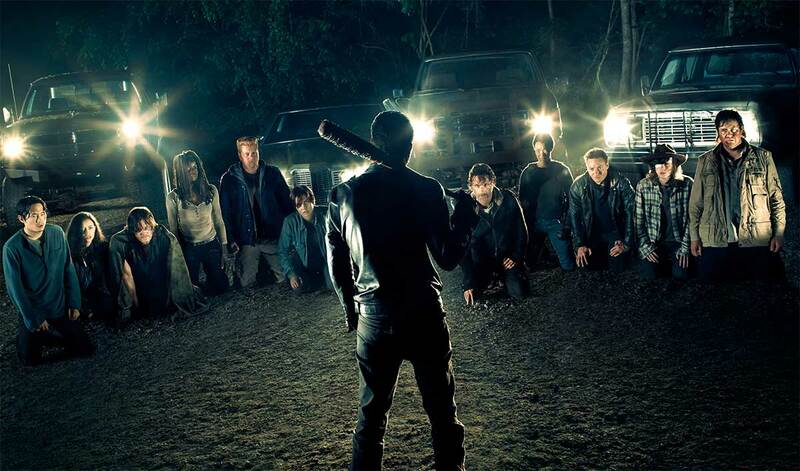 After months of waiting, viewers tuned in en masse to see who met their fate at the end of Negan’s famous bat Lucille, as well as the aftershocks that rippled through Rick’s group. I, too, was waiting anxiously to find out. I was talking about it hours before in my San Diego Comic-Con exclusive Lucille t-shirt and texting my friends about who I knew was going to die. I was nervous and I was scared, but I was also tired of waiting and talking about it. I wanted answers. As the episode started, I felt my heart pick up and my face flush. Did I actually want answers? I wasn’t sure anymore. But regardless of whether I wanted them or not, I sure got them. This episode picked up moments after the end of Lucille met her first victim. Negan looks into Rick’s face and asks one of his cronies what weapon Rick had before he was searched. He asked for the weapon, struck the axe from his belt, and dragged Rick by the scruff of the neck to the waiting RV for a little joy ride of sorts. He took him to one of the road blocks his saviors had set up to block the other group from going anywhere after defying Negan so many times — a road block that was now choked with walkers as the fire had drawn them there. Negan told Rick that it was do or literally die in his command: you obey or you all perish. There was no flexing on that. He delivered chilling line after chilling line and made the audience seriously on edge and scared for the fate of our favorite characters. Negan tossed Rick’s axe into the hoard of walkers and told him to go fetch it like dog he was training. With no choice, Rick was thrown from the RV and had to search for the axe and survive. If he didn’t do as Negan said — if he didn’t survive — it would be the end for the rest of the line-up waiting back where two had already fallen. As images flit through Rick’s mind of Lucille meeting the others, with Negan’s voice echoing from the RV, he makes the choice to obey and submit to Negan and his saviors. As they head back to what can be considered ground zero in this horrible string of events, a beaten down and scared out of his wits Rick is thrown back to the ground as Negan again delivers a speech to his terrified audience. He believes that Rick doesn’t truly get it. He grabs Carl, asks for a pen and draws a line across his arm. He instructs, with such icy ease, Rick to “go ahead and cut your kid’s left arm off.” Michonne pleads with Negan saying that the group understands where they stand, begs not to hurt Carl. Rick begins to panic and offers it to be his arm instead of his son’s. Negan repeats that in order for Rick to understand his new place, he will do as he says. Carl, understanding what needs to be done, softly tells his dad that it’s okay; he needs to do it. Tears, snot, sweat, and blood fall from Rick’s face as he pleads with Negan. Negan yells at him to do it and just as he raises his axe, Negan stops him. The group has finally understood the new dynamic; but most importantly, Rick has now come to terms with no longer being the man in charge. He knows that there’s no way out of this — that they’re outnumbered so heavily that they can’t topple this enemy in the way that they had done to those threats previous. The episode ends with Maggie weeping between the two pools of blood as the others carry the bodies away for burial. It’s been almost a week and I’ve still been thinking about this episode. It was truly a work of art. The writing was some of the best writing I have experienced on this show. It ran the spectrum of emotions and had me jumping out of my seat and white-knuckle clutching a blanket to my chest. I was sad, I was angry, I was scared. It was truly beautiful writing and exquisitely acted. Jeffrey Dean Morgan as Negan was terrifying in his villainy. He wrapped himself up in that character and delivered his lines with such ease and coolness that you weren’t sure you ever wanted to cross his path on the street. Andrew Lincoln, although always wonderful on this show, proved what a true talent he was as he masterfully made us believe this was happening to him: that he was scared and hopeful and capable and defeated. It was truly spectacular to watch. But over the last week, I have seen countless articles detailing how violent the episode was and how it crossed the line when it comes to what should and shouldn’t be on our televisions. It was graphic and hard to stomach in parts — of course it was — but I don’t think that it crossed any lines. I’ve always been a fan of really dark, gritty TV shows. My favorite show of all time is Sons of Anarchy, a graphic look at the world of a rebel motorcycle club, so I’m not exactly surprised by anything that crosses my path at this point. I’ve watched every episode of The Sopranos and Game of Thrones — TV shows far more graphic in nature than what happened in this week’s episode of The Walking Dead. It could be argued that the last two shows were on HBO and not AMC or FX, but it nonetheless shows that violent episodes are neither new, nor do they typically get called out for crossing any lines. What confuses me most about this episode being deemed too graphic or violent is that this sort of violence happens literally every other week on The Walking Dead. We watch as the group, in whatever formation they find themselves in at the time, decapitates a slew of walkers or burns them. We see axes meeting faces, bullets to brains, or running the walkers over with cars. How about the episode where Glenn has to watch Noah get trapped in a doorway and eaten alive by walkers? Or we see Bob’s leg get sawed off and roasted for dinner? What about those episodes? Were those not graphic and crossing the line? Or are we suddenly upset with the violent and graphic nature of the show because a living human took a barb wired bat to the head of two other living human characters? I believe that this is the crux of the argument. Even after six full seasons of nothing but death and decay, killing or eliminating every single foe or threat as they sought means of survival, a trail of dead walkers, I think that taking the violence from the walkers or “dead characters” to real, beloved characters was just too much. See, we can accept what the humans do to walkers because the latter are theoretically dead and therefore can’t really feel the pain of what’s happening to them. But the victims of Negan’s brutality were living, breathing humans that met their end for the sake of whipping the group into order. Moreover, the perpetrator of these heinous acts was a living, breathing human being — not a walker. I went into the episode knowing that what I was going to see would be graphic (and they warned you after every commercial break that it was going to be violent). They knew what they were doing, fans of the graphic novels knew what was coming, and yet we all tuned in anyway. It may have upset us and may have had us reaching for cover, but fans knew what they were getting into with this hotly anticipated episode. And to be honest, this episode was no more graphic than some other insanely popular shows still on air. I didn’t hear so many people losing their minds during The Battle of the Bastards earlier this year, so it seems odd that people are up in arms now over this show's premiere. It was, in my opinion, a beautifully shot, written and acted episode. It was an episode that should be considered for awards in many categories and set the tone for what is arguably going to be the best season of The Walking Dead. Art always goes too far when it's done right.